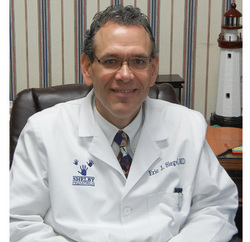 Dr. Eric Siegel MD - Welcome to Shelby Pediatrics - A piece of home for your children, a peace of mind for you. I was born in Louisville, Kentucky to loving parents pursuing careers at Appliance Park in the day of appliance development. My father's career eventually took my family to Rochester, New York and then onto Wakefield, Massachusetts. I spent many years in Massachusetts becoming a Red Sox and Bruin enthusiast. (Yeah Yaz and Bobby Orr!) I attended college at the University of Notre Dame during the exciting Joe Montana Years. Medical school took me to Jefferson Medical College in Philadelphia, Pennsylvania. This was followed by pediatric training at the nationally recognized Children's Hospital in Cincinnati, Ohio. I am married to an incredible wife and elementary school teacher. (She understands me well!) We have four children with many varied talents. I enjoy being creative, playing sports, and pursuing the Christian adventure. I am a member of AOA Medical Honor Society. I was board certified in Pediatrics in 1989 and I am currently involved in re-certification.